It’s certainly been a golden 12 months for Jack Laugher – and it’s been topped off with a Swim England National Award. The City of Leeds diver, who celebrated a clean sweep at the 2018 Commonwealth Games as he won a hat-trick of gold medals on Australia’s Gold Coast, was named Performance Athlete of the Year for diving at the ceremony held at the University of Birmingham’s Great Hall. He followed up his success in Australia with two more podium-topping performances at the European Championships in Glasgow, where he also picked up a silver medal. If that wasn’t enough, 23-year-old Jack also added a FINA Diving World Cup silver and bronze medal to his collection. Laugher said: “Thank you so much for this award – it means so much to me. 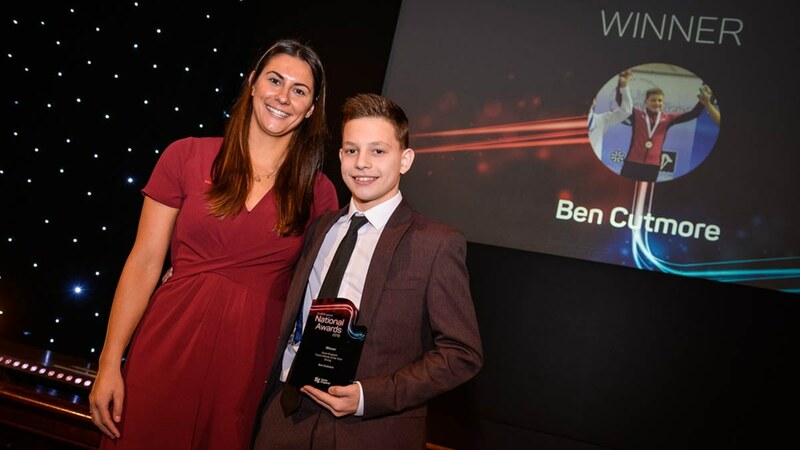 Dive London’s Ben Cutmore earned his reward for eight years of hard work as he won two major junior titles in 2018. First he struck gold at the 2018 European Junior Championships in Helsinki. Cutmore, 15, who started diving when he was seven, won the Boys’ B platform title by an impressive 48.35 points as he finished with a score of 429.70. And then Cutmore, who trains eight times a week, was also part of the successful Great Britain team that won the Mixed Team event at the Fina World Junior Diving Championships in Kiev. His achievements ensured he was named Swim England’s Talent Athlete of the Year for diving. He said: “It means a lot to me because there are so many talented young divers out there at the moment. Lois Toulson was the winner of the Spirit of the Commonwealth Games Award for diving after securing Team England’s first women’s platform medal at a Commonwealth Games in 44 years. Taking part in her first Games, Toulson secured a bronze medal in the women’s 10m platform event on Australia’s Gold Coast. She finished with a total of 344.20 points and said: “I wasn’t expecting a medal at all. I just really wanted to dive well and I’m really pleased with how I did. Toulson also took part in the 10m synchronised event alongside Robyn Birch.